A few months ago, we started an experiment with CoinHive on both NicheSiteAzon and some of our niche sites. It’s an interesting way of trying to monetize your site. In one way, it’s a bit like running ads on your site. You can keep your site free for visitors, but still monetize it. In another way, it means your visitors do still end up paying, because their browsers are mining Monero for you, and therefore their electricity is being used. Still, we wanted to experiment with it and see if it could be worth pursuing. Note: We are aware it can be slightly unethical to use Coinhive, so we put an “opt-out” button on all of the sites that used it. Second Note: This post was inspired partly by Perrin’s recent post over at AuthorityHacker. We’ve been using Coinhive since the summer, but after reading Perrin’s post, thought it might be good to add something to the debate. To explore a bit more about how coinhive works, read his epic post. For now, let’s talk about the sites we used and their results, as well as our motivation for the experiment. It’s not actually specifically because we wanted to earn cryptocurrency. We have actually been actively buying it for a while and investing it into ICOs, but that’s not the main reason we picked Coinhive. It is how we first heard about it though. What attracted us to coinhive in the first place was the fact that some of our niche sites weren’t earning as well as we’d like. There were a few that are nice earners, but there were also some with only 1,000 to 5,000 visits per month, and between them they earned a few hundred dollars p/m only. So we figured, if we could add this monero script miner to the sites, and then have them all still earning their original incomes as well, it could be a nice extra. So in total the sites we installed CoinHive on have a combined total of about 100,000 visitors per month. That’s not a small amount, and we hoped it could bring in a few hundred or thousand dollars per month. Our logic was that we could keep earning from the sites the traditional way, and just add Monero as an extra passive revenue source. So with that in mind, we had to ask ourselves, would it be worth having the above downsides? They’re pretty big downsides, but it could be worth it if the amount of Monero mined was big enough. With the minimum payout set to 0.5 monero, we are now stuck with a dilemma. Do we keep it going for another 18 months just to hit the 0.5 minimum, or do we cut our losses? It’s cost us nothing but some bad user experience so far, so we will probably be removing Monero from the sites. Even if it triples in price (and it’s already more than tripled since we first started using coinhive), it’s still not worth the wait and definitely not worth ruining the UX on our sites. It’s a shame though, because as we have enjoyed learning how to buy altcoins over the past few months, Monero has been one of the top ones we’ve had our eyes on. So Is CoinHive Worth Using? Regardless of whether you are interested in cryptocurrencies or not, the conclusion of this post is that we don’t recommend using Coinhive on your site. Unless the payouts become much higher, or Monero becomes significantly more valuable, using other means for monetizing your sites is probably going to be more worthwhile. That said, if you DO have a ton of visits to your site, it could be a good additional income. By a ton, we mean more than 1 million visits per month. But who knows, maybe this time next year Monero will be worth thousands per coin and we’ll wish we had at least gained a fraction of one for free. Today we're reviewing one of the most popular shared hosting options amongst affiliates and niche site entrepreneurs. This is none other than Siteground, a company that has gained an almost impeccable reputation over the last few years. We're going to have a look at their services to find out if they truly are that good of a choice for small and medium sized online business, WordPress powered blogs and affiliates. Sitegrounds offers a lot of hosting options, from shared hostings to enterprise-level solutions. We'll concentrate on this review on the shared hosting as other options are more geared toward big entrerprises and websites with traffic numbers on the millions per month. SG's shared hosting options will be the options that best suit most niche and small authority websites, so we'll stick to that. Starting out as cheap as $3.95 per month (if you pay yearly), Siteground's shared hosting plans are built on SSD, come with free SSL "Let's Encrypt" certificate and free CDN. To get their in-house developed cache tool SuperCacher, we have to go for the GrowBig or GoGeek. That tool really has a major impact on sitespeed, so it is a very valuable inclusion for their superior plans. To top it up, they offer 24/7 customer support for all customers and WordPress staging environments, pre-installed Git, WP-CLI for easy command line management options, PCI compliance for e-shops, 1 year Wildcard SSL for free, priority customer support, free backup and restore on their GrowBig and GoGeek plans. There's quite a lot to praise for this guys. Let's have a look at a few critial aspects of any good hosting and see how does Siteground rank. One of the main factors on your website load speed it's the speed at which the hosting serves the information to the visitor. As we know, site load speed is also a big factor on SEO, which is typically the main avenue most niche sites go for in terms of obtaining traffic. Hence, it's clear that we NEED the hosting to be fast. How fast is Siteground? ​One of the key indicators of good server loadspeed it's the time it takes to load the first byte of data once a user hits "search" for a given site. Another crytical point is the server location. Yes, the physical distance between where your website is stored and where your a visitor comes from plays a big part on load speed. Fortunately, Siteground counts with 5 different data centers​ across the globe: Chicago, London, Amsterdam, Milan and Singapore. Meaning you'll most likely be able to pick a datacenter that suits perfectly your website's targeting. For instance, if yours is an Amazon affiliate site focused on US, the Chicago server has great performance even for the furthest locations like California, so there's where you'd want to host your site. It doesn't matter if your server is able to deliver your site at ligthspeed if it's always down. This is probably the point where Siteground shines the brightest. Their 24/7 support is fast, polite, effective and available in English, Spanish and Italian. Typicall matters such as installing WordPress, moving from http to https, pointing nameservers or creating an email account for your site are solved with utmost efficiency. From my experience, if there's anything on the hosting-end of things that I don't know how to do or simply don't want to do myself, I just open a chat with customer support and ask them for help. It'll get solved within minutes, every time. ​ In fact, they run a satisfaction survey every year and they've never gone under 95%. With Siteground there's plenty of good to talk about, however, there are a couple of points we could say are the weaknesses of this hosting. ​One of the few things I'd wish was better with Siteground is their data storage limits, which are fairly low compared with other shared hostings. Sure thing, by the mere nature of a shared hosting (on which several sites share the storage space) it is understandable that they keep the storage low to keep the respond times as fast as they are. Most niche websites count with a handful images and perhaps a couple of videos per post, so the GrowBig and GoGeek plans will have enough storage for you. The way SiteGround has to regulate that people actually stick to what the plans support is their monthly allowance of "CPU seconds". What this means is a cap in the amount of resources your site is allowed to use per month. This is actually explained in terms of the "suitable monthly visitors" each plan suggests. But, what makes this a real con? Well, if you go over your allowance, your site gets a halt and you're notified to either upgrade plan or remain with your site on hold until next month's "CPU seconds" come in. Overall I'd rate SiteGround as one of the very best options in terms of speed, security, customer support and value for money from all shared hosting options out there. First off, I’d like to just say that when I first looked into semrush, I wasn’t making a lot of money online and the monthly fee seemed unecessarily high. This may also be the case with you, and if you can’t afford the tool, then that’s understandable. You can actually use click the banner below to get a free trial of the tool, which should get your love affair with it started, and you can come back later when you have more of a budget. For the meantime, let’s dive into this review. How Does Semrush Work? What Is It? Semrush Pricing – Is It Worth It? Semrush calls itself a competitor research tool, and it is, but it actually has a lot more practical applications. You might be thinking “Ok cool, but how do I use competitor research to my advantage? And I’ll explain that in the rest of the article. For now, here’s a quick overview of how you might use Semrush. The page above is where everything begins. Enter a competitor’s URL above, and you’ll be presented with a list of keywords they rank for, what position they rank, who their competitors are (so you can rinse and repeat), and a lot of other information as well. You can figure out what their best performing pages are, whether or not they’re buying traffic from Google, and you’ll also get some insights into their backlink profile. This is a snapshot of the keywords NicheSiteAzon ranks for. A list of sites we share keywords with. This gives us a chanc e to look at what they rank for that we might not have thought of targeting yet. Gold. Now, semrush definitely doesn’t have the best backlink checker in the world. Ahrefs and Majestic are superior here. However, that doesn’t really matter, because what I use Semrush for has nothing to do with checking backlinks, as I’ll explain in the next few sections. For now, just know that Semrush allows you to find out a lot of insanely useful keyword data about your competitors. You’ll uncover a lot of keywords that don’t show up in other keyword tools, and that alone is gold. What a lot of people don’t realize is, Semrush also works great if you put your own site into the tool. You’ll find a bunch of hidden keywords you didn’t know you rank for. You’ll find untapped opportunities, and you’ll get good ideas about which posts to target for on-page and off-page seo improvements. Thanks to this, the money you spend on Semrush could end up saving you money on link building, so ultimately, you come out ahead. For the next part of this review, I’ll look at practical applications of semrush. In other words, how do I use it, and how can you use it to benefit your site? Use it to find keywords you've not optimized for, that you can easily rank for. Use it to highlight which posts you should link build to first. Use it to find "weak" keywords that forums are ranking for. 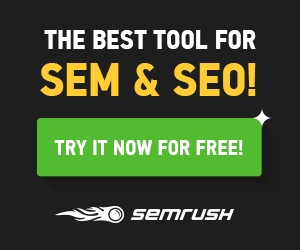 This is one of the easiest ways to benefit from Semrush. I’ll tell you this now. If you’ve never checked, there are no doubt dozens of keywords that your site ranks for, that you had no clue about. On top of that, many of these keywords will be ones you’ve not optimized your site for. Let’s say you are targeting a certain keyword with your post, like “best shower head”. Once that post ranks quite highly, you’ll naturally rank for other keywords as well, such as “best plastic shower head” or “good shower nozzle” and so on. It just happens. Put any post into semrush and you’ll see it ranks for dozens of keywords. What also happens is that some of those keywords you will rank quite highly. Position 12 or something like that. For many of these keywords, you won’t even have that keyword anywhere on your page. This is because Google knows your article covers that topic. It knows that an article about shower heads is also going to be relevant to searches about shower nozzles, for example. What I find is that 90% of the time, if you go back to that article and add the keyword in somewhere, within a week or so (depending on your site’s age and authority), you will jump up in ranking for that keyword. You can rinse and repeat this so many times and increase rankings and traffic without adding more posts. The more rankings your site has, the more you can do this technique. Here are three examples of keywords where I did the exact method talked about. I started tracking them in Serpfox the day I did the optimizations, so you can see the results almost instantly. Now, it doesn’t always work. Some keywords won’t budge even if you add them to your post. It doesn’t take much work to do this though, and the fact that some keywords will have a major increase should make it very much worth your while to do. You can rinse and repeat this technique every few weeks as well, because as you rank higher for these keywords, there will be other ones appearing. This alone could pay for semrush in no time, assuming you have your traffic monetized. Whether you’re doing white-hat link building, or something more grey-hat, you don’t have infinite time or money. You’ll want to make sure you’re able to get the most results out of your efforts, or money. Semrush can help with this (although Ahrefs might be better if this is your only focus, as ahrefs has superior backlink crawlers). 1.) I put my site my site into Semrush and see what it shows me for keywords and rankings. 2.) I then look at “pages” and see which pages have a lot of rankings and keywords “nearly” on page 1. For example, you might think you want to do your link building to your main money page, but Semrush might show you that another post is actually much closer. It could already have 1 or 2 keywords on page 1 or at the top of page 2. For me, this would go straight on the list of potential link building targets. I’d do further analysis into the competition before deciding 100% to target this post, but Semrush is responsible for putting it on my radar. It’s all too easy for us to get blinkered vision and just focus on 1 or 2 posts, without realizing we could get some other posts earning money in the meantime, just by giving them a bit of link juice. I use the word competitor lightly, because a lot of other sites in your niche might not really represent pure competition. What Semrush defines as your competition is a site you share other keywords with. 1.) Starting with the competitors that share the most common keywords (in this case, nichehacks), we could click on them, and then get a list of all the keywords they rank for. 2.) By manually going through the list, we’re going to get dozens of ideas for keywords we hadn’t thought of targeting. Some of them will be “quick win” keywords that we can add into our existing articles to increase the keywords they rank for. Others will give us entire new article ideas. Just because a competitor ranks for a keyword, doesn’t mean we are automatically going to rank for it too just because we wrote an article. However, it’s great for finding new content gaps and opportunities. 3.) For further wins, look for keywords where your competitor ranks for them, but the article they are ranking isn’t all that relevant. For example, maybe a competitor ranks highly for something like “roll on vs aerosol deodorant”, but the article ranking is not that related to the keyword. It could be something like, “best roll on deodorant”. The fact they’re ranking highly for it without really targeting it or writing something useful, shows an opportunity. You can write an article that targets the keyword more accurately, and you’ll have a pretty good chance of ranking well for it. Not every competitor will have keywords like this, but if you spend enough time, you’ll be able to find some. 4.) Additionally, you can look at the competitors for one of your specific posts and see if you’ve missed any keywords. Let’s say you have a post on page 1 of Google and it ranks for 20 different keywords. Maybe the other sites on rank 1 with you are ranking for 30 or 40 keywords with the same posts. If you go through each one of those posts and see what they’re ranking for that you’ve missed, and then go back and add them to your post, you’ll not fail to increase your traffic to that post, and might even rank a bit higher as a result. This is similar to the “quick win” opportunities mentioned above. It’s well documented that when you find a keyword where 1 or more forums are ranking, that keyword should be easy to rank for. The problem is, how do you find keywords where forums are ranking? You find some forums, you enter their URL’s into Semrush, and you use a filter to find all the keywords they rank on page 1 for. To make it even better, filter it to only show the ones they rank in the top 3 for. I’ve used this to find dozens of keywords in almost every niche I’ve entered, and at least 30% of them I ranked for very quickly. Josh is the man behind this strategy, which I’ve linked to right at the start of this article. If you want to know more about it, you can follow this link as well. I’ve just shown you an almost infinite number of ways to use Semrush. Ok, only 4 ways, but they’ll keep you busy for what seems like an eternity. The question is, does it pay for itself, and how much is that exactly? The snapshot above shows the three pricing tiers available. To learn more about exactly what comes with the plans, go here. You can also get a 7 day free trial through that link. $99 per month is no small fee, and the average beginner niche site builder may not be able to afford it. That’s fine, because if you are a complete beginner and don’t have the budget yet, you also don’t need to get semrush yet. It’s not something you can really benefit from until you either have a number of sites and regularly use this tool…or until one of your sites starts getting itself some rankings. In my case, I signed up for a free trial once my site started making $100 per month, and I had scaled that to $500 per month within 3-4 short months. Semrush played a large part in that. Essentially, you need to be earning some money and getting some rankings and traffic in order to really benefit from it (though you will still benefit in an earlier stage if you can afford it now). Once you use it though, it pays for itself quite quickly. If you’re able to increase the number of keywords you rank for, increase the positions they rank at, and get new content ideas all with one tool, you’ll definitely increase your revenue beyond $99 per month. Only you can say if you have the budget for it. I will say that you don’t absolutely 100% need Semrush in order to succeed, but if you can afford it, you will absolutely benefit. I would probably struggle with only using one tool! However, if I did only have access to one…Semrush would definitely be a contender for that tool. It depends, does WordPress count? All joking aside, it’s for good reason that I use this tool almost every day, and if you can afford it, you’ll love it. Remember, you can click the banner below to get a 7-day free trial. Have you thought about building your own Private Blog Network but didn't know where to start? ​Having your own PBN can have tremendous benefits in creating a profitable niche site, but it can be an extremely time-consuming, confusing, and expensive process. And the most frustrating and difficult aspect of building out your own network has got to be the actual process of finding powerful and spam-free expired domains ​to use in your network. In today's post, I want to introduce you to an amazing piece of software that I've been using lately that makes finding expired domains as quick and easy a process as I've ever seen. Have you identified a potential market idea that you'd like to build an Amazon affiliate site around, but aren't sure exactly what types of products you should be reviewing and promoting? Knowing which types of products you should be promoting is absolutely crucial in making sure that you'll have a successful Amazon niche site. In today's post, I want to show you one piece of software that I use every time I create a new niche site, and how it simplifies and expedites the entire process of finding which types of products I decide to write about.